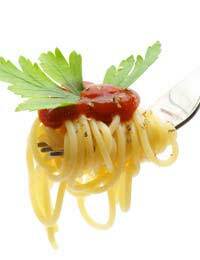 Pasta is such an accommodating food for any cook and the variations on its use are many. Vegetarian vegetable pasta is just one more way to cook this tasty food. There are many varieties of pasta from the curly fusilli and the bow shaped farfalle to the shell shaped conchiglioni to the straight more commonly known pasta that we use with our Bolognese sauces. At the end of the day use whichever pasta your family prefer and what the children will eat! You can have fun making your own pasta, it is easy and with a proper pasta rolling machine the task of getting the right thickness and length is easily remedied. However many chefs use the ready-made pasta that is so easily purchased either dried or in the chiller cabinets in most stores. The choice of vegetables to use in your vegetable pasta recipes is long. You can go for whatever vegetables are in season from local organic farmers or opt for Mediterranean foods now found in the supermarkets. Try some new unusual vegetables or stick with old firm favourites like carrots and mushrooms – the choice is yours! Preheat the oven to 210 degrees C or gas mark 7. Slice the aubergine, deseed and slice the peppers, wash and slice the courgettes using a potato peeler to give fine long slices. Place into a baking tin and liberally sprinkle with olive oil. Place in the oven for thirty minutes. Take out and turn vegetables. Pierce the cherry tomatoes with a fork and add to the baking tin along with the crushed garlic, button mushrooms and chopped basil and replace in the oven for fifteen minutes or until cooked to your liking. Put the pasta shapes into hot salted water and cook in a deep saucepan until tender. Remove from the heat and drain. Add the cooked vegetables adding another tablespoon of olive oil at the same time. Serve in warmed bowls topped with grated fresh parmesan cheese. Garlic bread is a tasty accompaniment to this meal. If you prefer a sauce with your vegetables try a small tub of crème fraiche stirred into the vegetables and pasta or heat a can of chopped tomatoes with herbs and thicken with tomato paste. Many supermarkets now stock goods quality olive oil that has been flavoured with herbs, garlic or even lemon. These are handy things to have in your store cupboard to boost a pasta meal or to accompany vegetables. Vegetable and pasta can be served hot or cold. The cold version is ideal to take to work in an airtight box for lunch and makes a tasty change to sandwiches. Made the night before and stored in a fridge you will find that the garlic and herb flavours intensify overnight.